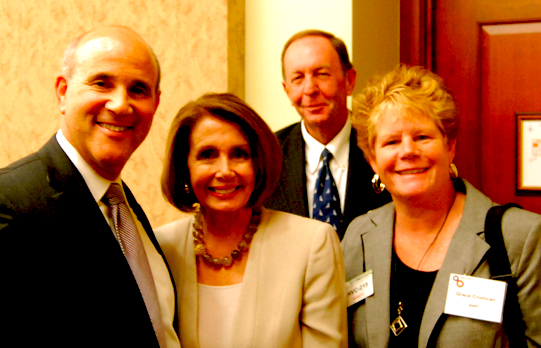 Bay Area Council CEO Jim Wunderman, BART director Grace Crunican, and MTC representative Tom Bulger in the Capitol with Rep. Nancy Pelosi in 2011. On October 3 a business lobbying organization released a poll claiming that Bay Area residents are in “overwhelming agreement” that BART workers should accept the current contract proposal offered by the transit system’s management in order to avoid another strike. That offer would actually amount to a pay cut for most BART employees, but it was described in the poll as a “raise of 10 percent.” The survey’s overall design seems geared to elicit a result favoring BART management. No doubt this is because the business lobby that paid for and helped engineer the poll has an interest in driving down labor costs and freeing up BART’s revenue for system expansion. The lobbying group that paid for the poll is the Bay Area Council, or BAC. The BAC was formed in 1944 as a coordinating committee of the region’s biggest banks, construction companies, manufacturers, oil giants, and real estate corporations, most of them headquartered in downtown San Francisco. The impetus to create the BAC stemmed from the frustrations of elite corporate executives who, during World War II, worried that the Bay Area’s fragmented geography and multitude of county and city governments would prevent the creation of grand transit and industrial projects. The war time boom minted huge fortunes for these tycoons, but they feared northern California’s auto-driven sprawl would diminish real estate values in their cherished urban core, San Francisco, and further that it would drive up operating costs for their companies as their white collar employees, and some of their peer companies, dispersed to the suburbs. Alan Browne, a senior vice president at Bank of America who participated in this masterful campaign to establish BART said the problem was, “essentially just a breakdown on the movement of people,” from the hinterlands to the urban core. Joining Browne was Adrian Falk, the president of S&W Foods. Falk helped raise funds and coordinate the 1962 ballot campaign to launch BART. S&W Foods, today known as Del Monte, the $3.8 billion corporate agribusiness giant, is still headquartered three blocks from BART’s Embarcadero Station. After helping wage the successful public relations campaign for BART’s creation, S&W’s Falk became the first president of BART’s board of directors. Falk told the local newspapers quite frankly that the main purpose of BART was to create the necessary people moving infrastructure to benefit the wealthy downtown corporations already located in San Francisco. “Certain financial, banking, and industrial companies want to be centralized, want to have everyone near each other,” said Falk. “They don’t want to have to go one day to Oakland, the next day to San Jose, the next day to San Francisco.” (For a lengthy discussion of BART see John Dickey’s Metropolitan Transportation Planning, 2nd Edition, 1983, p. 378). Executives of Bank of America, Wells Fargo, and Crocker National Bank, all with their headquarters just blocks from BART’s planned stations running along Market Street, were instrumental in the campaign to create the transit system. For example, Bank of America CEO Carl Wente was the chair of the BAC’s rapid transit committee and chairman of the fundraising effort for the ballot measure that funded BART. 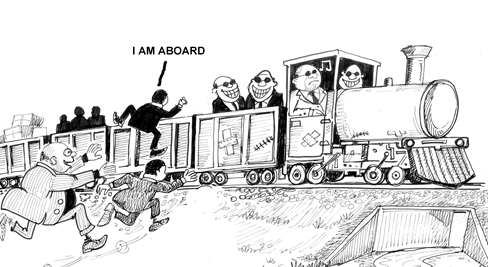 More than a few of the BAC’s corporate members made fortunes off the construction of BART. No sooner had BART collected its first pot of sales tax revenue in 1958 then the District’s leadership paid Bechtel and Tutor to design the railway. Bechtel’s offices were again both located just blocks from where the planned funnel of BART trains would dump workers along Market Street. Bechtel, the giant engineering and construction company then busy building petroleum and nuclear plants around the world, later landed the contract to build BART’s tunnels and tubes. More recently Tutor was paid over $600 million by BART to build the SFO extension, and millions more to build the South San Francisco and San Bruno stations. The S.D. Bechtel, Jr. Foundation to this day funds the Bay Area Council. Bay Area banks underwrote the bonds for BART, skimming millions off the discount fees and interest payments secured ultimately by regressive bridge tolls and sales taxes. That one thing was profitable enough for Bank of America. Other financial institutions made millions over the years financing BART, and Wells Fargo and Crocker National (merged into Wells Fargo in 1986) saw their downtown San Francisco fortunes boom. The foundations established by these banks currently funnel dollars to support the Bay Area Council’s activities, including the recent poll it paid for about BART. Bank of America Foundation, US Bank, and the Wells Fargo Foundation all channel money to BAC. Is it any surprise then that the Bay Area Council, a big business lobbying group, with its origins in the campaign to create BART and finance it with regressive sales taxes and passenger fares, would sponsor a poll today pressuring BART’s workers to accept pay cuts? Today the Bay Area Council continues to to be the mouthpiece for some of the same mega-corporations that built and benefited the most from BART, including Wells Fargo, Bechtel, Clorox, Bank of America, and the hospital giant Kaiser that was spun off the industrial conglomerate of the same name years ago. More than a few of the current members of the Bay Area Council have a strong financial interests in cutting the compensation of BART employees in order to free up more revenue for costly system expansions. The Orrick Herrington & Suffcliffe law firm was paid a pretty penny in 2010 bond as counsel to BART on a $129 million sales tax bond flotation. Orrick law is a member of the BAC. Last year Orrick earned another pot of money on BART’s $240 million sales tax bonds. BART is a big client for Orrick. Every time the transit district needs to borrow money it’s likely that Orrick will be paid to help structure a deal. The trustee on most of BART’s bonds is US Bank, a member of the BAC, which basically inherited the business from Bank of America. In 2009 BART’s board of directors fed at least two $15 million dollar contracts to URS Corporation, another member of the BAC, for various engineering and construction work related to the system’s expansion. In 2007 URS won a $10 million contract from BART to manage construction upgrades of BART’s elevated train lines. URS makes a lot of money from BART’s capital budget, having helped build three BART stations. A vice president of “corporate strategic planning” with URS currently sits on the Bay Area Council’s board of directors. The real estate developer TMG Partners has multiple projects that will be affected by BART’s investments of public funds. Just earlier this year the San Francisco Business Times straightforwardly published an article about TMG entitled, “Landlords snap up sites near BART, Muni stops.” On its web site TMG says its vision is to “take advantage of [an] under-construction BART station,” by building an 1,100 unit apartment complex with a hotel in San Bruno where real estate values are poised to climb thanks to BART. TMG’s chairman and CEO Michael Covarrubias is a board member of the Bay Area Council, and his company is a corporate member. Another member of the BAC, the engineering company CH2M Hill, was awarded a $25 million contract earlier this year to advise BART on vehicle maintenance and refurbishment. CH2M Hill’s prime contract includes multiple subcontractors like BAC members URS and Arup North America. The Pillsbury Winthrop Shaw Pittman law firm is another Bay Area Council member with deep financial links to BART. Pillsbury has been paid millions by BART to lobby for the transit agency in Sacramento for many years. A Pillsbury partner Robert James has represented BART in real estate deals around planned stations. Robert James is a board member of the BAC. 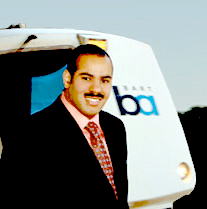 Bay Area Council member Citibank has underwritten multiple BART bonds in prior years. Citibank has also sold BART complex financial derivatives like the 2004 interest rate cap that cost BART $245,000. Citibank’s Rebecca Macieira-Kaufmann is a BAC board member. And of course joining all these CEOs whose companies do multi-million dollar business with BART on the board of the Bay Area Council is BART’s general manager Grace Crunican. Remember when BART helped a few giant multi-national corporations establish lucrative tax shelters? You probably don’t. It hasn’t been written about much in the press. The type of deal BART agreed to has gotten some attention, but even so, most people are unfamiliar with the scheme and how it works. BART’s tax shelter deals almost cost the transit agency $40 million in 2009 when the financial sector was melting down. One of the agreements withered and BART lost $5.5 million. Few people know this. So what sketchy tax shelters am I talking about? They’re called lease-in, lease-out, or LILO agreements. BART calls them lease, leaseback agreements in their financial reports. In a LILO deal a public transit agency like BART leases its trains or train operating equipment to a private corporation for some extended period of time. The corporation immediately turns around and leases the property back to BART. The terms of the lease are incredibly complicated and circuitous. I wont go into details here. It’s the kind of creative accounting and contract law that vast financial disasters are made from, and it’s mind-numbing in detail. Why would BART ever do this you ask? The most immediate answer is because it provided up front cash payments to BART which the agency then capitalized over a period of future years. This had the effect of easing BART’s budgetary strains, and providing BART with more borrowing capacity. It was the closest thing to free money the agency had ever been offered besides its cut of the regional sales tax, and it could be gotten without political pain, without appealing to voters for a bigger trim of retail sales. And BART wouldn’t need to confront the big real estate corporations in San Francisco and Oakland that have benefitted so much from the system. Million of dollars could be generated out of a shuffle of paperwork and a fictitious transfer of capital through a circular lease agreement. Of course BART would never characterize it that way. Nor will the financial corporations that have been the instigators of these deals. It all began in the 1970s when some clever bankers and lawyers devised a tax sham that essentially transfers an unclaimed tax deduction from a public, non-profit agency to a private corporation. The public agency cannot claim the deduction because it doesn’t pay federal income tax. It has no taxable income to offset with a deduction. But once the capital assets and debt are transfered to a private party with large taxable earnings then the possibility of a massive tax cut becomes realizable. Here’s how it works: the private corporation takes out loans from banks or hedge funds and either purchases or leases the assets of a public agency. The public agency turns right around and leases the assets back. The lease and the sublease are more or less designed to cancel one another out over the term of the agreement so that neither party actually profits off the other. The private corporation claims a tax deduction on the debt it incurs when borrowing funds to buy or lease the public agency’s assets. In addition, the corporation can claim depreciation deductions as the value of the assets decline. 1. Transit system and investors agree to lease and sublease. 2A. Transit system places portion of investor’s “head lease” with a Payment Undertaker who will pay out the transit system’s lease obligations. 2B. Transit system uses left over cash for whatever purposes it wants. This is the “free” money that LILOs generate for public agencies. 4. Private investors obtain tax breaks on debt and/or depreciation of the assets they virtually own. 5A and 5B. When the lease’s terms are up and the lease and sublease payments net out, the deal expires and the assets return to the transit agency. These deductions are the central purpose of the LILO deal and they allow big banks to reduce their federal tax burdens by billions of dollars each year. For helping the private corporations and banks profit off of these tax loopholes the public agency gets a small cut in the form of cold hard cash. It’s all essentially a transfer from federal taxpayers to private corporations with a small portion flowing to local public agencies that facilitate the deals. It’s hard to blame transit agencies for setting up these tax shelters after decades of tax cuts in federal and state assistance. Faced with declining real revenues relative to their needs transit agencies across the US have entered into LILO deals. In the Bay Area the list of transit agencies that have completed LILO deals includes AC Transit, MUNI, SAMTRANS, Santa Clara Valley Transportation Authority, and San Jose’s RTA. The Bay Area region’s transit agencies have allowed giant corporations and banks to claimed billions in tax deductions over the last two decades. BART has done multiple sale-in, lease-out, and lease-in, lease out deals. In 1995 BART sold 25 of its train cars to a Swedish subsidiary of General Electric called GE Credit Finans AB for the price of $50.38 million. This was a sale-in, lease-out (SILO) deal, a predecessor to the LILO tax shelter strategy that is similar in form and substance in that there’s not economic rationale to it besides dodging taxes. In the 2002 deal BART immediately leased the cars back from GE at a price of $48.36 million. The $2 million difference in what GE paid and what BART paid was cash in BART’s pocket. That deal appears to have worked out more or less as it was planned. BART gained $2 million and GE gained some lucrative tax break by deducting a portion of the $50.38 million from its tax bill, either as debt used to finance the initial purchase, or perhaps by depreciating the assets until the deal expired in 2011. Federal taxpayers had to make up for whatever GE didn’t pay over these years by cutting programs, or going further into debt. Deals like these are part of the bigger web of tax shams that allows GE to basically not pay federal taxes anymore. It was BART’s 2002 LILO deal that blew up in the agency’s face. That year BART leased its rail traffic control equipment to private investors under a 40-year agreement valued at $206 million. BART was to be paid $23 million for setting up the tax shelter for several corporations. The 2002 LILO deal was especially complicated. BART agreed to deposit most of the lease payment made to it by the private investors with a “payment undertaker,” a third pary who would invest the funds and pay BART’s sublease to the investors until 2018. If, however, the payment undertaker’s credit rating dropped below a certain level the private investors would have the right to cancel the sublease and demand huge termination penalties from BART. In 2008 credit markets froze and the financial system crashed. Credit downgrades struck most banks, insurance companies, and corporations. BART’s payment undertaker AIG was downgraded and BART faced a possible $20 million termination fee unless it could replace AIG with a AAA-rated party. That might have proven possible a year prior, but few financial companies were retaining the vaunted AAA grade. What’s more is that the banks and corporations on the other side of BART’s LILO deal wanted to force BART to pay the termination fees so they could call the deal quits and book a big profit. Why did they want to close out the otherwise lucrative tax loopholes? Because the IRS was catching up to them. SILO, LILO and similar deals have been the target of IRS investigations since they originated. The IRS considers most of them mere shams and has attempted to outright ban them on several occasions. Fearing that the taxman was closing in, the firms on the other side of the LILO deals with dozens of major transit agencies nationwide sought to force the public to pay the big termination fees. The fees would be straight up profits, taxed yes, but not subject to the possible clawback sought by the IRS. To counter this threat transit agencies like BART banded together and got legislation introduced in the U.S. House and Senate that would have taxed any termination fees at 100 percent. Other lobbying maneuvers made the termination demands of the banks very unpopular, and most transit agencies were able to successfully renegotiate the deals. In September of 2009 BART ended up terminating a portion of the 2002 LILO deal with a company called Key Equipment Finance, Inc. Wrapping up this part of the 2002 LILO agreement cost BART $5.5 million. The agency was able to salvage the rest of the deal, it appears, saving local taxpayers millions more. But saving the deal meant that federal taxpayers are still being stiffed out of millions in income taxes offset by the deductions claimed on the private end of the LILO deal. And yes, BART workers might strike beginning at 12:00am, Monday. The workers have been characterized as “greedy,” and “paid too much” by the major newspapers and TV networks. Meanwhile the tax shelters that earned wealthy investors millions over the last two decades by using BART, and putting BART at great risk, have gone mostly unanalyzed. In 2012 Larry Ellison, CEO of the Redwood City-based Oracle Corporation, was awarded a compensation package worth ($96.1 million) nearly as much as the entire healthcare and pension costs of all BART employees ($101 million). Are Bay Area Rapid Transit employees paid too much? It’s amazing that the question is even being asked. BART’s board of directors, general manager, and chief negotiator put this rhetorical query in front of the public during the strike two weeks ago as part of their strategy to undermine sympathy for BART workers. BART even set up a web site to spread it’s narrative of greedy employees, http://bartlabornews.com, where “Bart Rider” is soberly informed that “BART employees contribute $0 toward their pension plan, BART riders and taxpayers fund their retirement plans.” The point of public relations communiques like this are clear: in the Bay Area’s economy BART employees consume too many tax dollars and don’t have a legitimate need to maintain their existing pay and benefits. BART management added pension and healthcare contributions to their tally of employee pay to claim that their employees “earn an average of $134,000,” even though pension and healthcare expenses are not cash equivalents for BART employees, and even though the healthcare expenses actually benefit BART as an employer by keeping their workforce healthy and productive. Even so most news outlets dutifully reported the average pay of BART employees and included health and pension costs as if this were cash, erroneously implying that the train system’s workers take home six figure salaries. BART’s labor costs. Source: BART, Fiscal Year 2013 Preliminary Budget Memo, March 30, 2012. It’s amazing that the pay of BART’s employees has gained so much attention from the regional media in the first place. For over a decade the Bay Area’s major newspapers and TV news stations have been guilty of failing to adequately cover one of the most important stories of our time: rising income and wealth inequality, and the decline of middle class jobs in the face of inflation, globalization, automation, and the tax revolt that has scaled back the public sector. And now that most of the Bay Area’s news outlets finally reported a story about the pay of middle class public employees they bungled the story by framing it inside a question pre-packaged for them by an anti-labor consultant from Ohio: don’t BART employees make too much already? The BART strike readily tells the big-picture story of austerity for millions of workers and exponentially growing incomes for the wealthy few. Let’s therefore re-frame the question of how much BART employees are paid and consider their compensation, its source and impact on the wider economy, to that of the top 1% of California’s income earners. The average BART train operator has a base salary of $47,000, and takes home about $66,000 in cash when overtime is accounted for. Station agents have a base salary of $52,000 on average, and take home about $68,000 when overtime is included. Because BART employees have their healthcare and retirement costs currently covered, this means that their decent salaries are largely spent on housing, food, recreation, and other goods. All of this spending, including healthcare and eventually purchases made using retirement income, happens almost entirely within the Bay Area. What goes around, comes around, with $275 million in wages for BART workers fueling sales and profits for businesses in the Bay Area, feeding back into the budgets of other cities and local agencies. Let’s now compare what BART employees make to the compensation of the region’s top one percent of income earners, the CEOs of Silicon Valley’s tech companies, and San Francisco’s financial institutions. In 2012 Larry Ellison, CEO of the Redwood City-based Oracle Corporation, was awarded a compensation package worth ($96.1 million) nearly as much as the entire healthcare and pension costs of all BART employees ($101 million). Ellison has been raking in this kind of cash for decades and is one of the wealthiest men in the world. Last year he spent $300 million to buy an island in Hawaii. For that same sum of money Ellison could have bought every single BART train car and still had $44 million left over, enough to pay the overtime clocked by every single BART employee, and still he’d have $13 million left to buy a couple more trophy homes like his house on Broadway in San Francisco’s Pacific Heights, but truth be told in spite of the America’s Cup, most of Ellison’s fortune doesn’t get spent in the Bay Area. It sits in bank accounts, or is held as shares in corporations, or goes toward acquisitions of boutique real estate in distant enclaves of global wealth. last year Ebay’s CEO John Donahoe was paid a lot more ($29.7 million) than all of BART’s 348 station agents combined ($23.6 million). His pay package could have covered their salaries and overtime, and picked up 2/3 of their healthcare and pension costs. Wells Fargo’s CEO John Stumpf was paid ($19.3 million) almost enough to cover the total pension and healthcare costs of all BART train operators and station agents ($20.8 million), a combined workforce of 832 employees. It’s hard to imagine Stumpf spending even five or ten million in one year on groceries, transportation, and other goods from Bay Area businesses. Meg Whitman, CEO of electronics giant Hewlett Packard, was paid ($15.3 million) more than double the total cash earnings of BART’s 131 utility workers ($6.4 million). John Martin, the CEO of Gilead Sciences, was paid a bonus ($3.37 million) that exceeded the total healthcare costs of BART’s utility workers ($3.09 million). So who’s paid too much? What is “enough” when it comes to the amount of money a person needs to live with dignity in California’s Bay Area. Keep in mind that the above described levels of executive compensation are not determined by “natural” market forces. Nor are these spoils calculated by sober boards of directors mulling over the services these executives provide. Pay at the top of the corporate food chain is as much a matter of culture, power, and politics, as it is the outcome of a supply and demand curve for managerial talent. That’s the lesson of the BART strike. The wages and benefits that will be afforded to BART’s employees are being struggled over in a political fight, not determined by mathematical economic principles. When it comes to the eight figure pay packages afforded to CEOs today, on the culture side America has simply slipped further into an ethical quagmire that allows the polarization of classes between an elite few who are hoarding immense fortunes, and the many who live increasingly in debt. In political terms, those at the top of the economy engage constantly in their own version of collective bargaining, but instead of trying to wrest pay and benefits from management through unions, their focus is set instead on the U.S. federal tax code. As the management, holding the financial and legal resources necessary to lobby and influence legislators and regulators to write favorable legislation and to look the other way, these men (mostly they are men) have the power to often get what they want. And the decline of labor unions over the past four decades means that there is virtually no serious counter-force to fight them, to demand a more equitable economic regime. The pervasive use of stock grants and stock options to pay company executives is now the top cause of massive pay packages for management, including those outlined above. Corporations shifted from simply paying their executives seven figure salaries to paying seven and eight figure stock grants and options packages when Congress disallowed tax deductions on salary expenses above $1 million in 1993. The law that disallowed deductions on salaries in excess of $1 million was an ethical rule resulting from the scandalous damages caused by excessive greed at the top of the economy in the 1980s and early 1990s. Management raided corporate wealth, crashed entire companies, and the response was to regulate the tax benefits they were gaming to enrich themselves. Larry Ellison’s $96.1 million in pay primarily comes in the form of $90.6 million in options to purchase shares of Oracle Corporation at a set future date for a set price. One of the reasons companies like Oracle pay their CEOs this way is that they can deduct this sum from their federal corporate income taxes, along with bonus payments and stock grants. If a form of compensation other than base salary can be characterized as “performance-based,” then it can earn a corporation a tax benefit. Ellison’s compensation last year in the form of stock options therefore may have sliced upwards of $32 million off Oracle’s federal tax bill. Ellison will have to pay taxes on his $90.6 million (or more if Oracle’s stock price outperforms the options pricing model they used to guess the value of the shares he may purchase), but until he exercises the options it’s all deferred. 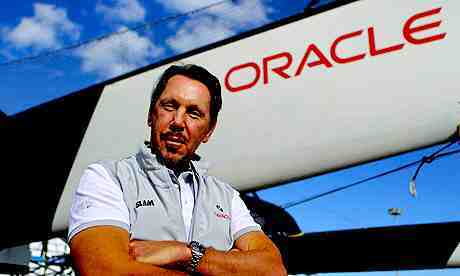 So last year Oracle and Ellison temporarily sheltered $90.6 million from the tax man. When Ellison exercises his options he pays federal income tax on their value, and he’s likely in the top marginal bracket, but that bracket is at a historical low point. Massive reductions in income tax rates for the wealthy are part of the reason people like Ellison have become so enormously wealthy in recent years while the federal budget has run continuous deficits. If Ellison holds the shares and they appreciate further in value, he can later sell them for a capital gain. Capital gains are taxed also at historically low rates of about 23.8 percent for the wealthiest handful of people like Ellison who currently own more than half of all stock in publicly traded companies. So although federal taxpayers supposedly “make up” for the loss of revenue deducted by Oracle when Ellison pays taxes on his stock options, the taxes Ellison is paying are quite low. The other Bay Area CEOs you likely wont see riding BART because they can afford their own private jets are also paid mostly in the form of stock grants and options, creating valuable tax deductible expenses for their firms, and providing the executives with securities that can be held for years and sold for quite large capital gains. Earlier this year Citizens for Tax Justice, a research organization that studies inequity in the tax system, found that 280 of the largest U.S. corporations used stock option executive pay to reduce their tax bills by $27.3 billion over three years. A good chunk of these deductions are potentially retained by corporate America as a kind of arbitraged profit because of the quirky accounting rules that allow them to basically guess the value of the stock they’re granting when they report their income to shareholders, but to then use the actual cost of the stock options to determine their eligible deduction when they’re exercised by the executive. The difference between that guess and the real price when exercised is all gravy. This quirk is entirely the product of lobbying by corporations and the wealthy to maintain a loop-hole permeated tax system set up for them to game. Silicon Valley tech companies are among the biggest users of stock option compensation awarded to CEOs. Apple, Facebook, HP, Oracle, Google, Cisco and others therefore also reduce their federal taxes by billions each year. Source: Citizens for Tax Justice, “Executive Pay Tax Break Saved Fortune 500 Corporations $27 billion Over the Past Three Years,” April 24, 2013. So what’s the connection back to BART? A lot of BART’s funding for capital improvements comes from the federal government, and once upon a time transportation funds for operations were also available from the federal government, but these were mostly eliminated beginning in the Reagan administration. The loss of federal funds for operations and maintenance is a serious crisis for many of the nation’s bigger transit agencies like BART, and few think operations assistance will return due to the chronic federal budget crisis. The squeeze on federal funds available for capital expansion also mean that transit agencies have to raid their own fares and tax dollars to come up with funds to pay for expansions. All of this creates the pressure that leads to the politics of austerity and demands that workers take cuts to shoulder more of the burden of funding public goods. When you zoom out and look at the entire system by which transit is funded, it’s clear that the political victories of the wealthy and corporate America to reduce statutory tax rates, and avoid taxes through numerous loopholes, sets the stage for conflicts between public sector workers, transit riders, and local government managers. BART board member Zakhary Mallett has taken one of the harshest positions against BART workers during contract negotiations and the strike. The BART board of directors has kept their reasons for selecting Veolia’s Thomas Hock as their lead negotiator a secret in spite of growing outrage from the train system’s workforce who call Mr. Hock a “union buster.” The unions are now demanding that Hock be fired and that the board retreat from its position to take away pay and benefits from their members. Still it’s not clear what the board’s strategy has been and why it hired Hock. Communications that BART’s directors have had with one Richmond city council member seem to indicate, however, that BART’s management selected Hock to take actions that they were unprepared, or unwilling to undertake themselves. Two days after the four day strike ended Mallett told the San Francisco Chronicle’s Matier and Ross that his goal was to drive down the workers’ wages. “If someone is making $1,000 an hour for a job that can be done for $20 an hour, then they don’t need a raise,” said Mallett. Mallett’s hyperbolic characterization of BART employee compensation was far off the mark, however. The average BART employee (including management and executives like general manager Crunican who earns $320,000 a year) is $83,000. Hourly that’s about $40. Many BART workers in fact already make Mallett’s prescribed $20 an hour. Beckles tells me that without further explanation from BART’s management the selection of Hock appears to her a reflection of a concerted strategy to break the unions. “It seemed clear that in selecting [Hock], BART management was planning for a strike,” said Beckles. The BART system’s regressive funding structure and lack of revenue for maintenance and expansion is essentially the root cause of the conflict between the workers and BART board, an otherwise mostly progressive collection of politicians, a majority of whom were elected with support from the unions. BART has too little funding to upkeep the system and expand it, and therefore has been stretching funds used to operate the system, including worker pay and benefits. “BART workers do not pay any portion of their pension costs and they pay less than 5% of their medical costs. Recently at the bargaining table, you asked your workers to share a greater portion of responsibility for these growing costs. This year, we are asking the same from BART workers. In a recent poll, 72% of the residents of the three-county BART district agreed that workers should assume some of the costs of their pension and health care packages. Beckles tells me she thinks this stance will lead to another strike. Thomas P. Hock, Veolia Transportation’s vice president for labor relations, former president and CEO of Professional Transit Management. An under-reported facet of the BART strike concerns the private consultants hired by BART to negotiate with its major unions, SEIU and ATU. BART’s most important, and most expensive consultant is Thomas Hock, a lawyer from Ohio who is the vice president of labor relations for the Veolia Transportation company. In this week’s East Bay Express I’ll be providing a report on Hock’s record as a consultant and contract negotiator to both public transit authorities and private transit corporations in their recent bargaining sessions with employees. Be sure to check that story out. What follows is some extra information I didn’t fit into that report. In addition to Hock’s record at Veolia, his past as a businessman is also relevant to his role in the current BART negotiations. Before he was employed by Veolia Hock owned and managed his own private transit corporation called Professional Transit Management, or PTM. PTM obtained contracts to operate transit systems in over a dozen U.S. cities in the 2000s, including the city buses in Cincinnati, and paratransit buses in as far flung locations as Racine, Wisconsin and Tucson, Arizona. Veolia purchased PTM from Hock in 2008, folding PTM into its U.S. transit operations. Prior to Veolia’s purchase of PTM, Hock’s company had already garnered a controversial reputation among workers, a reputation that has stuck to Hock personally. Hock’s controversial reputation stems partly from allegations of racism and discrimination made against PTM by its bus drivers and other employees. The most serious case involved PTM’s Springs Transit facility in Colorado Springs, Colorado. PTM ran the city’s bus system under contract. Hock oversaw the operation from his office in Ohio. Professional Transit Management, Thomas Hock’s company, was the Defendant in an EEOC lawsuit that found “egregious” discrimination against Latino, Black, and Asian employees in the company’s transit facility in Colorado Springs, CO. The EEOC sued Thomas Hock and his company and obtained a consent decree from the United States District Court for the District of Colorado in 2007. The consent decree required PTM to implement numerous changes at the Colorado Springs facility in order to wipe away the environment of racist hostility that managers had allowed to flourish. The judge also ordered PTM to pay six employees $450,000 in damages. Download a copy of the Consent Decree obtained by the EEOC here. Check this week’s EBX for further background on BART’s chief negotiator, Thomas Hock, and his former company PTM.